A new skin arrived on the grid! Silken Moon released a brand new skin. “Simone” is the perfect skin for all who wish to keep their young look. The skin is very detailed what you will see if you take a demo and look at the body. It is made very realistic looking. Every pixel was placed with love and thoughts. The high lights are incredible awesome set. For example the collar bones are wonderfully accented, to get the imagination of a well shaped and beautiful body. “Simone” comes in 8 new and different skin tones. If you purchase one of the “Simone” skins you get a lot of additional extras with it. Each skin has 2 cleavage options, an eyebrow shaper, Slink hand and feet applier HUDs for all 8 tones and as well an open and a closed lips option with matching prim teeth for the perfect smile 😉 . Besides the natural tinted eyebrows you get some real crazy coloured eyebrows like green or pink and you get one tintable option to make it any color you like. For some it might also be interesting that Malicia Python, mother and creator of “Simone” and owner of Silken Moon, offers a free service for Lola appliers as well. The makeup which I added on “Simone” as well comes from Silken Moon. The “Autumn Eyes” in gold so repeated the lines of the amazing clothing. The whole set of the “Autumn Eyes” contain wonderful dark and warm colors, wich are perfectly for the actual season. Usually I do not wear any eyebrows anymore but with the cool options of the “Simone” skin I could not resist to add some green eyebrows that went with the outfit so well 😉 . The lipstick is one of the new “Simone Lips” in lavender. 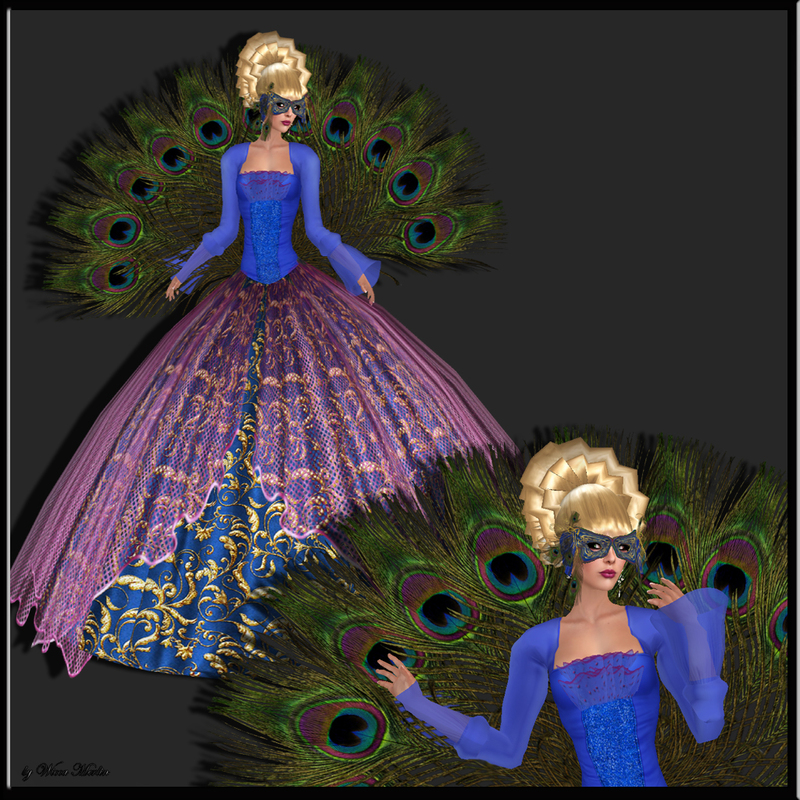 But Malicia did not only release a new skin… she as well made some amazing mesh clothing like the “Paradox” outfit. 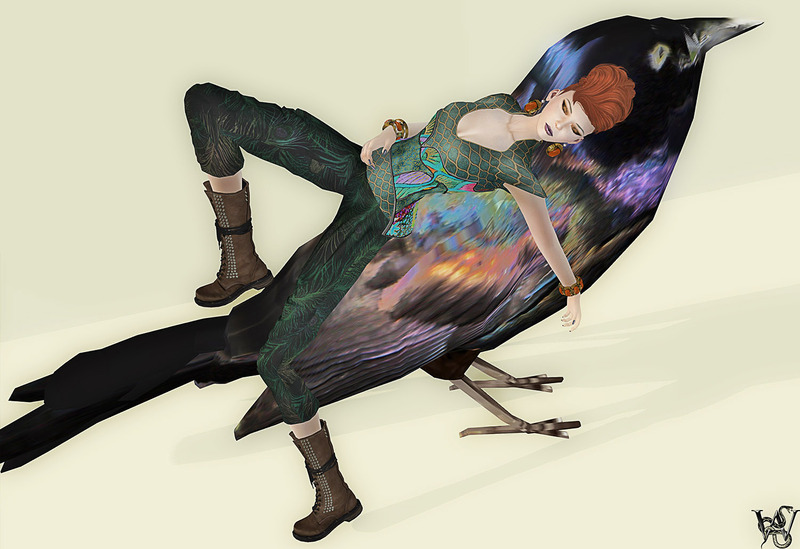 The “Paradox” vest and pants in the peacock version caught my attention as i never saw such a rich textured outfit in so many different colors that go so well together 😉 Usually I am more the black type, but with the beautiful pattern of the pants and the amazing texture of the vest it was just a ‘must have’ for me. There is way more variations of the “Paradox outfit at Silken Moon and you can combine, mix and match all of them with each other. The dark teal, green texture goes along so well with the ‘cool pale canvas’ version of “Simone and I could not resist even red hair to all the colors and wild makeup combination 😉 . To add even more color and repeat the orange tone of the hair and the “Paradox” vest, I decided to wear the new “Kaya” set from Lazuri. With the amazing menu that does let you recolor nearly every little part of the set it was easy to set the gems to orange and get some gold and wooden look for the metals. The poses are from the latest release from Corpus. The “Lounge Series 001” are a full set of amazing sits. But we all know Corpus for unusual and amazing editorial poses and so the new set is not just a bunch of simple and usual sit. You have half laying poses like i used on the first picture and as well some ground sits in it. A real must have for every blogger and photographer! “Nautilus” is an extraordinary creation, that combines so many different fabrics and textures – it is just amazing. The feathers have a peacock look while the top has a wonderful snake-skin look. White Widow meets Fellini Couture!!! 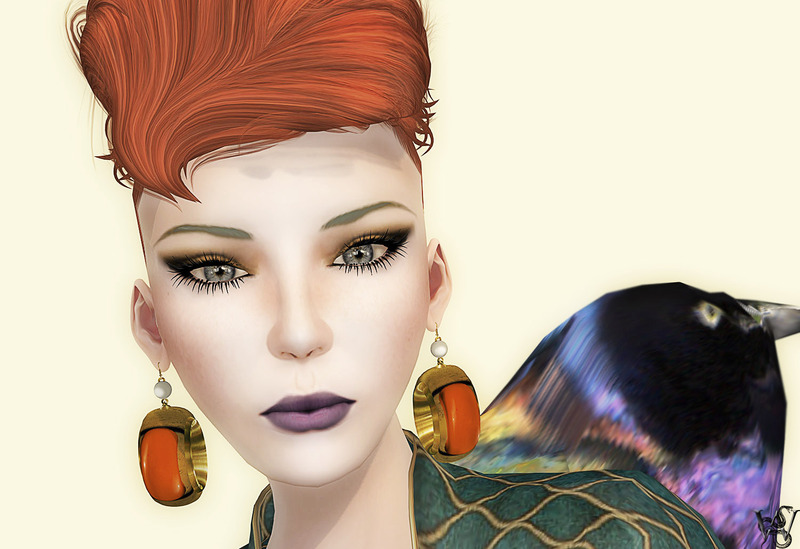 Fellini Couture, known for extravagant and fanciful designs did a nice cooperation with White Widow,fantastic face tattoos made by Julie Hastings! “Hera” is a wonderful little piece of art. The skirt is not symmetric, it only falls down on the right side of the legs. The texture Joy Fellini chose is an arrangement of black peacock feathers very filigree and highly detailed. The waist part also is a combination of fathers and flower petals. A tight prom corset surrounds the waist and is decorated with sweet little buttons in the front. For the top we have a shoulder free corsage that makes a wonderful cleavage. Again we have a prim attachment on the upper hem of the top that also repeats the theme of this stunning dress. 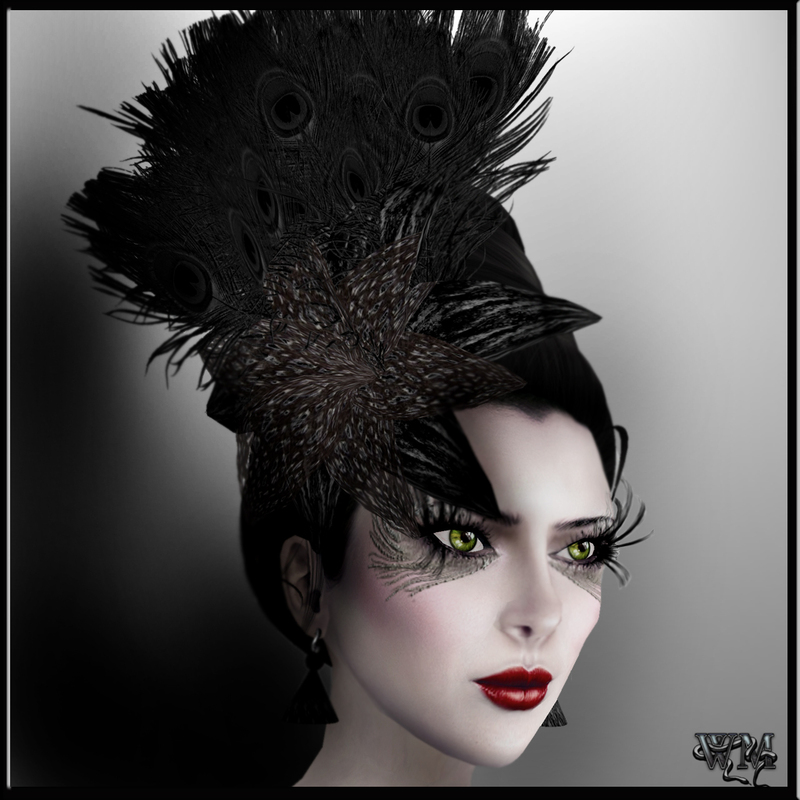 The incredible headpiece with the big dark orchidee is also part of the outfit as well as the earrings! Again above the orchidee we can see the black peackock feathers we have in the skirt also. This pair of fantastic heels requires one of the new viewers like SL 2.0 or higher or one of the new ones that feature alpha layers. This made it possible to have the amazing lace on the feet and still can show toenails!!! The amazing high plateaus are perfect for a very stylish and fashionable outfit like this. The shape of the heel is a nono usual one and shows off character 😉 In the front you can see wonderful gemstones. The shoes come with HUD that allws to change the colors of the gemstones and a few others features like the nail color also and you can match your shoes perfect to your skin tone! If you TP to the Mea Culpa Mainstore you will find more of that incredible shoe designs that really stand out in the design and ideas! 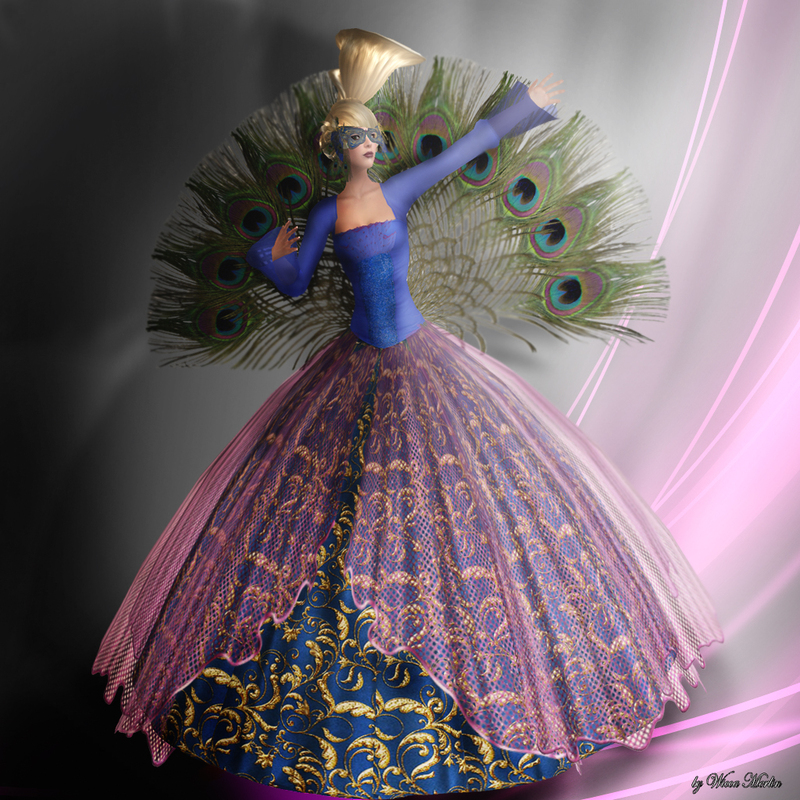 This special gown was made for the Le Cirque de la Mode – The Fashion Circus (May the 15th to May the 23rd) The huge, dark blue skirt is ornamented with an amazing detailed golden pattern and very filigree, flexi top skirt in dreamy pink that lays with an open front lightly on the main skirt. The top, also in blue has amazing details on the texture if you take a closer look and the chest is decorated with an amazing pink seamed cute ruffle. Another highlight is the big peacock feather fan in the back beginning at the waist. It adds a very classy and sophisticated touch to the whole creation. Another highlight is the brilliant mask that matches the gown perfectly. 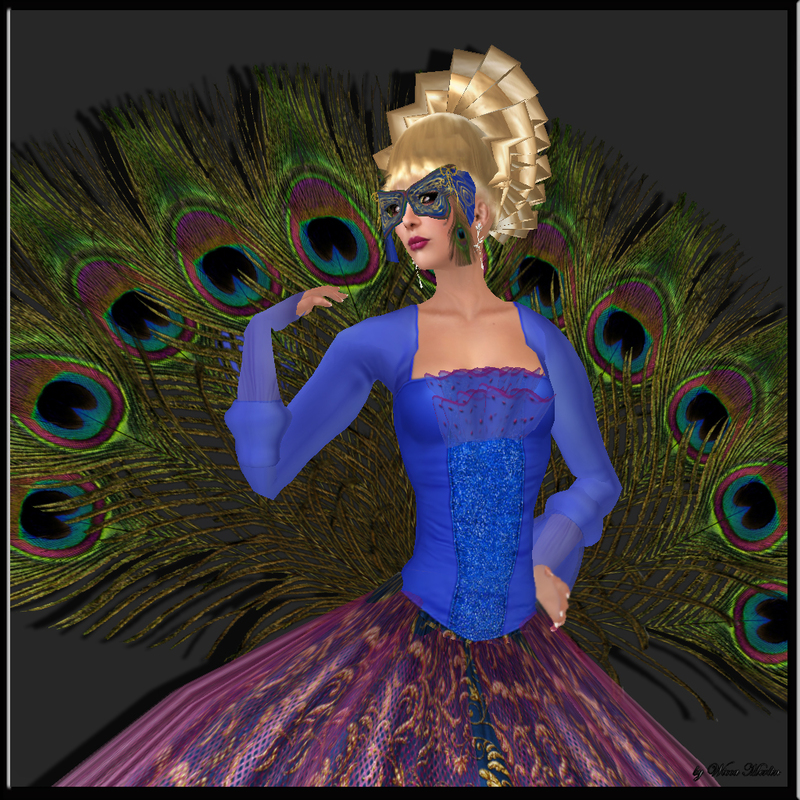 The basic color of the mask also is the same great blue that you find in the skirt and top and also it is ornamented with a golden pattern. Little flexible peacock feathers are repeated in the mask and filigree golden lines, also flexible give the perfect mystical look. “Island Princess” romantic and mystical. 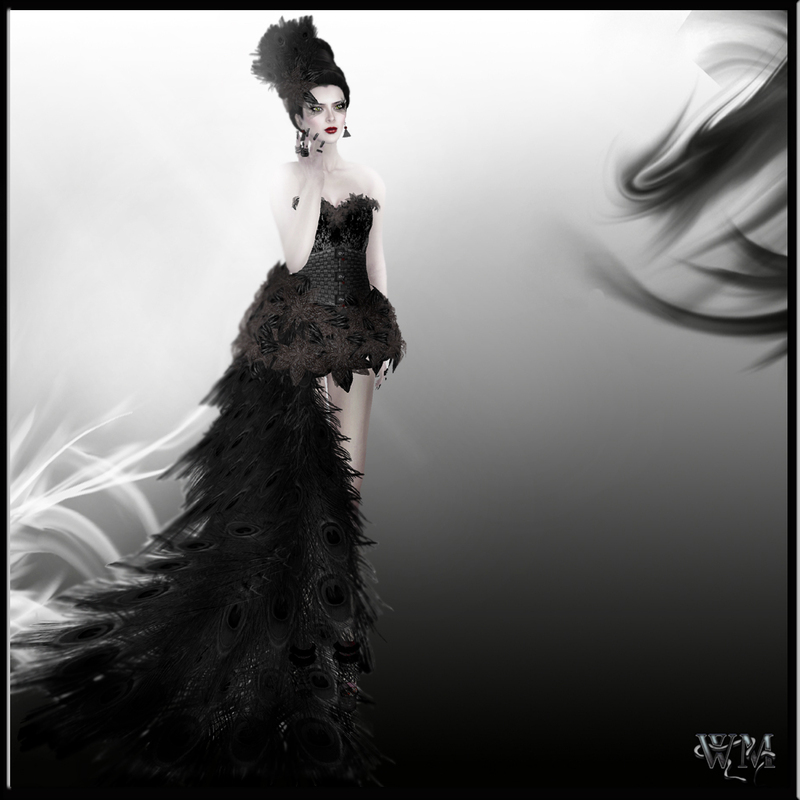 You also can find the gown in the Exclusiva Mainstore. This lovely gown comes with 2 different skirt options and an amazing, cute hat in a lightly vintage style with lots of ruffles that make it to an eye catcher. The first skirt version we can see in the pic above. The skirt is made if 3 awesome flexible prim attachments. One for each side and a bigger one in the middle that makes the back of the skirt looking like it has kind of a small train.